Vancouver, British Columbia – December 1, 2017 – A.I.S. 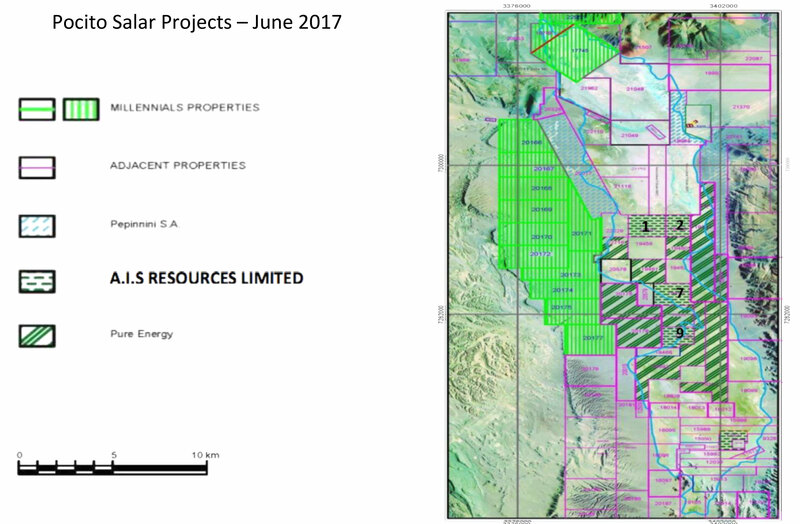 Resources Limited (TSX: AIS, OTCQB: AISSF) (the “Company” or “AIS”) is pleased to announce that it has begun exploration activities in the Salar de Quirón, (the “Chiron Project’) in the Province of Salta, located approximately 10 kilometers from the township of Pocitos. Environmental impact assessments have been completed on all four concessions. Applications for sampling, seismic, and 6,000 metres of drilling have been submitted. A VES geophysics study is being prepared by Quantec Geoscience Argentina S.A. to cover the newly acquired concessions. AIS has planned an intensive exploration program of sampling, mapping, geophysics and drilling for the period December 2017 – March 2018 and plans to complete a NI 43-101 compliant study in the first quarter of 2018. The 60-kilometre-long Pocitos salar basin has been previously drill tested with 12 shallow holes in 1979 by an Argentine government agency. The most significant result from the historical work programs includes a shallow drill hole, which averaged 417 parts per million (ppm) lithium and 15,300 ppm potassium. However, AIS’s recent research suggests that highly concentrated brines are at 100-350 meters depth. AIS has completed research to understand the likely occurrence of lithium rich brines in the Salar at depth. The research model suggests that at least three adjacent salars in the region of the Salar de Quirón have been exposed to significant tectonic and volcanic events during the Proterozoic period “burying” previously existing salars at depths of 100-350 meters. AIS intends to determine the extent of this hypothesis. In 2010, Li3 Energy Inc. announced the results of 46 brine samples taken immediately east of the Chiron Project, with brine assays ranging from 300 ppm to 600 ppm lithium. Millennial Lithium Corp. and Liberty One Lithium Corp’s August 2017 VES survey reported encouraging results in the area of the Salar de Quirón near the Chiron project (view here). Portions of Pure Energy’s October 2017 VES seismic traverse the Chiron project (view here).